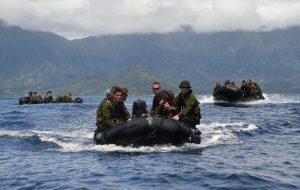 Among the many directives in the government’s new defence policy is a mandate for the Canadian Armed Forces to be able to concurrently conduct up to nine distinct operations around the world. It also seeks to expand the capability and capacity of the Reserve Force, and to improve how the CAF operates in the Arctic. Major-General Simon Hetherington, commander of the Canadian Army Doctrine and Training Centre, spoke with Canadian Army Today about the implications for the Army. What impact does being prepared to meet nine missions simultaneously have on the Army’s training system? We translate those missions into force posture and readiness outputs. From that, we work backwards to determine the training to meet those outputs. Obviously, our overarching Adaptive Dispersed Operations (ADO) doctrine drives much of it. The Chief of the Defence Staff has been very clear about the concurrency factor. Can we do all nine missions simultaneously? He wants to know where our shortfalls are. As a training organization, starting at the top with our force posture outputs, how do we train to meet those missions? Do we have the people to do it? The equipment to do it? The training mechanisms to do it? We’re still working on answering all those questions to meet the requirement. And as the world changes, we have to adapt. The United States Army has recently changed its doctrine – they are now all about large scale ground combat operations. It’s almost back to the future for those of us who grew up in the Cold War, preparing for all eventualities in northern Europe, and fully committed to NATO assurance and deterrence measures. But we are also bringing in all the things we have learned in the intervening years – joint operations in a multinational context, interagency and intergovernmental cooperation, the rise of social media, cyber and information operations. So, although the force posture and readiness outputs are still being developed, we are very clearly articulating what it is we see as foundation training. If you are the commanding officer of a Reserve unit, for example, what is the level of training we expect from you? For a Reserve organization, it’s Level 2 live in a Level 3 context, so an infantry section doing a live fire attack with a platoon headquarters over top, certified by a company commander. Foundation training is difficult to articulate sometimes. 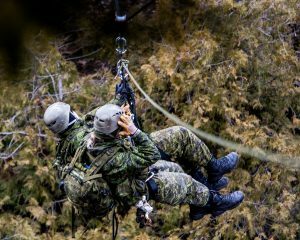 We have units like the 4th Engineer Support Regiment (ESR) or the 4th Regiment General Support Royal Canadian Artillery that are not conventional units. 4 ESR does theatre opening. The 4th RGS has capability like medium range radars and unmanned aerial systems. Is a section attack their foundation training? Or is their foundation training a package that will link to the force posture and readiness output? We have to understand what level of training we want on the various stages of the road to high readiness so we can make best use of the resources available to us. Is the very definition of foundational training starting to shift as you look to incorporate cyber and other capabilities? Yes, and the mission tasks we have assigned to the Reserve are a good example. If a Reserve unit has been tasked with one of these missions, whether it’s mortars, pioneers, direct fire support, light urban search and rescue, we have to define the level of training they require to augment the Regular force. 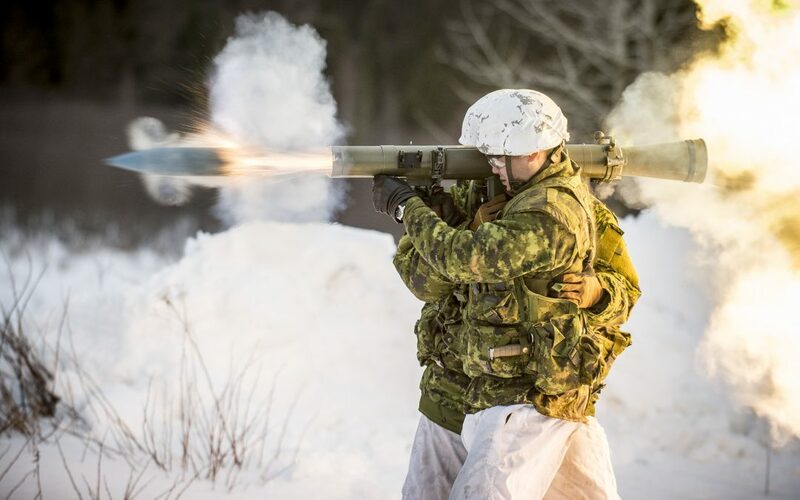 General Wynnyk is quite clear on his aspiration to have Reserve mortar organizations become fully integrated into future operations, so this would require the part-time Army to develop a full-time capability in that mortar platoon by then. In addition to foundational training, the Army was also emphasizing specialized training based on the geography of various units – mountain, littoral, airmobile, desert, jungle, Arctic. Is that still the case? We are looking closely at the applicability of what we called the regionally aligned environmental responsibilities. We had 2nd Canadian Division lined up for littoral or amphibious operations, for example, but what does this mean? We are not going to create the US Marine Corps out of 2nd Canadian Division and have them storming the beaches. We might need certain capability to be interoperable, but we’re too small to specialize in that way. Through our centre of excellence for individual training at the Canadian Army Advanced Warfare Centre (CAAWC) in Trenton, we are developing individual expertise such as Arctic operations advisors. For collective training, if we need to take a company and understand how to do littoral operations, maybe that becomes resident in certain organizations. The 3rd Battalion, Princess Patricia’s Canadian Light Infantry out west, for instance, is sort of the collective lead on mountain operations. Back in the day we used to be excellent at winter warfare and we’ve lost some of that because of our time in Afghanistan. Do we need every soldier to be an Arctic expert? Probably not, but I think every Canadian soldier should know how to live and operate in cold weather. Resources always come into this, but our Arctic operations advisor course at CAAWC is a great way to train people who can serve as advisors on winter warfare or Arctic exercises like NOREX or NUNALIVUT. Our force generation model relies on a period of warning and theatre-mission specific training. If we are required to go into a jungle environment, we would have time to do theatre-specific training. During the Afghanistan conflict, we knew the environment we were getting into, so Maple Resolve was that theatre rehearsal exercise. Now it is an exercise to practice those sets and reps to put the brigade at a level of readiness to launch into theatre-specific mission training when the time comes. The US Army has shifted to a multi-domain battle concept from its more traditional air-land concept that aims to deliver effects across the littoral, space, cyber and human dimensions. This obviously also applies to Canada. What’s the training challenge to meet this? I’m still trying to get my head around that concept because, to me, it is what we do. We operate now in that multi-domain world. I have always believed we need to expose our people as soon as possible to all those elements with which they will interact on operations. In Afghanistan, a company commander could interact with a government development worker, a special forces guy, or an NGO. The first time that happens shouldn’t be down range; it should be in a training environment. That is what we try and replicate in exercises like Maple Resolve and Unified Resolve, understanding other organizations and building relationships. I think it is small “e” education about each of these domains. For a rifleman in an infantry battalion, he has to be able to operate in a denied, degraded and disrupted electronic spectrum where his GPS might not be working or is being spoofed, so space and satellite systems matter. Likewise, understanding the information space and how it can be exploited. When we deploy to Latvia, we know the servers for cell phone service are probably located in the East. It’s no secret we don’t use some of our stuff for that very reason. I’ve always been a believer in never giving an order you can’t enforce, so you can’t say, ‘nobody bring cellphones.’ This is how we live today. But we can educate how to operate in those environments. How is the joint aspect of this becoming more ingrained? The JOINTEX series of exercise is gaining steam. We’ve just had a symposium led by CJOC where JOINTEX figured prominently. 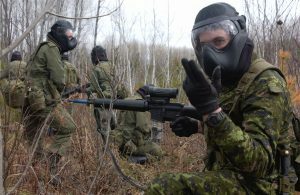 One of the visions is, does this become the premier training event for the Canadian Armed Forces in which you would see exercises like Maple Flag, Maple Resolve and others brought together? It’s difficult to do for a whole bunch of reasons. But we want to build that. And that could include those intergovernmental relationships, but there’s also the interconnectivity of our systems. We have to identify and work through those challenges. And, again, back to force posture and readiness outputs: what is it that we’ve got to be prepared to deliver? Can more of this training be conducted in a virtual and distributed manner that still retains enough realism? If I can be so bold as to have a vision, that is what I would see for simulation. We are working on this with something called the Virtual Training Environment Network. I can see this being the case at the next Unified Resolve or two from now, where you have the 1st Canadian Division stay in Kingston and work with the brigade and other elements at their locations. The challenges that we have with our simulation systems and our command and control systems is that they need to replicate the equipment and tools we have on operations. We could build a slick video game, but when our men and women prepare to go out the door, if the training systems don’t deliver exactly what they are doing on operations, what good was the training? We are making some good strides in that. 1st Canadian Division and the Canadian Army Simulation Centre are absolutely superb at providing that higher command force and integrating those joint assets. Bringing a full blow air picture into what we do is a challenge, and our folks are working on that. Are these tools also now more a part of individual training? This is one of my personal areas of focus – individual training modernization evolution, leveraging the technology we have. There is an organization resident in Military Personnel Generation Command that is looking at virtual reality goggles and all kinds of distributed learning packages, including ways to do things using your phone. We have small arms trainers in which you can repeat over and over your tests on essential training. It’s has to be balanced. We can’t just say, ‘we’ll get an app for that.’ We still need physical hands-on leadership for some of the things that we do. Is there a risk of training becoming too impersonal, especially if the future operating concept requires young adaptive and dispersed leaders? Part of mission command is trust. And that is personal. A leader has to develop his or her subordinates. I think you are bang on: if we want to have ADO, you can never get away from eye-to-eye, hand-to-hand physical leadership. Sometimes it’s not always about the technology, it’s about how we teach. We are engaging with adult learning technologies and adult learning skills. If we truly believe in the mission command philosophy about producing commander’s intent, we’ve got to empower junior leaders to teach in the best way they can to get their message across. We are constantly working with our training development people to understand that. I would love to have a wiki page where an instructor could type in ‘section attacks’ and then up would come official doctrine, lessons learned, and perhaps a discussion forum to share ideas for teaching the course. What resources does CADTC need to do deliver on these policy demands? We have to recognize the pace that we keep. Not only are we moving the force forward, we’re also growing the force. The hardest I ever worked was as a captain at the artillery school. It is relentless and a lot of work. Our manning is okay, but we have to watch the pace on our people. And we want to make sure they get rewarded as they come back into the field units. You become a master of your craft when you become an instructor. Trust is key, and to compliment that, we have to become comfortable with failure. I am not trying to preach, just collective encouragement – to give ourselves room to make mistakes. Great interview and access to our senior leaders. Thanks Cdn Army Today.